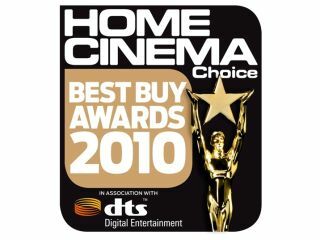 Home Cinema Choice - part of the TechRadar network - held its 15th annual Awards ceremony on 23 April. The Awards were an opportunity to recognise the best in home cinema equipment, with an emphasis on innovation, performance and value. Sponsored by DTS, Future Publishing's Home Cinema Choice Awards featured 23 categories ranging from Best Buy TVs and amplifiers to media servers and discs. Winners were selected by HCC's editorial panel, but the fun didn't end with the judging; for the lucky winners, there was a day in the spotlight at the exclusive Awards ceremony. Held again this year in the Apollo Cinema in London's Piccadilly, the Awards were hosted by top TV funnyman Dominic Holland, whose hilariously humorous assault on AV geekiness brought him perilously close to being clubbed to death with the winners' statuettes. Boasting over 150 guests from the AV industry, the Awards prompted laughter, tears and emotional speeches - it was just like the Oscars, but with cheaper goody-bags. After the ceremony it was the usual mad dash to the bar for an in-depth analysis of the results, and a good old industry gossip. HCC Editor Chris Jenkins said: "The Awards are a great way to thank the industry for the support it's given Home Cinema Choice over the last year. "We're thrilled with the excellent turnout and the positive comments on the event, and as usual we're grateful for the invaluable contribution of our generous sponsors DTS. "The standard of nominees was higher than ever this year, but in a process combining measured debate and one use of strong language we've come up with some marvellous winners. We've made a special effort to reward innovation, with new award categories for products such as media streamers. With products such as 3D and Freeview HD causing a buzz in the next year, there's plenty to be excited about going forward. "We have ambitious plans for Home Cinema Choice, and for the website at www.homecinemachoice.com, both of which will be exploring new opportunities and markets as home entertainment technology evolves in exciting new directions." Full details are in issue 182 of the magazine, on sale 6 May. To find out more, point your browser to http://hcc.techradar.com.